Product information "sPLA2 Assay Kit"
Phospholipase A2 (PLA2) catalyzes the hydrolysis of phospholipids at the sn-2 position yielding a free fatty acid and a lysophospholipid. The release of arachidonic acid from membrane phospholipids by PLA2 is believed to be a key step in the control of eicosanoid production within the cell. The Cayman Chemical secretory PLA2 (sPLA2) Assay kit provides an accurate and convenient method for measurement of sPLA2 activity. 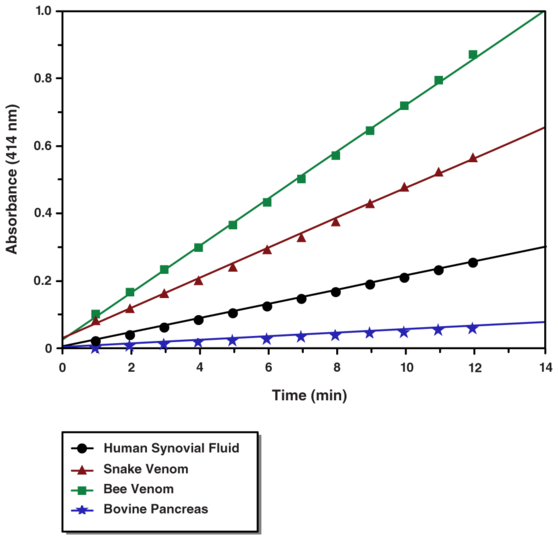 This assay uses the 1,2-dithio analog of diheptanoyl phosphatidylcholine which serves as a substrate for most PLA2s (for example, bee and cobra venoms, pancreatic, etc.) with the exception of cytosolic PLA2. Upon hydrolysis of the thio ester bond at the sn-2 position by PLA2, free thiols are detected using DTNB (5,5-dithio-bis-(2-nitrobenzoic acid)). Customer review for "sPLA2 Assay Kit"